About two months ago, I reviewed the color version of the Eni Puzzles and at the time I noticed that they had just launched a black and white version, which looked rather interesting. I was recently able to get one of these for review, so keep reading to find out more. 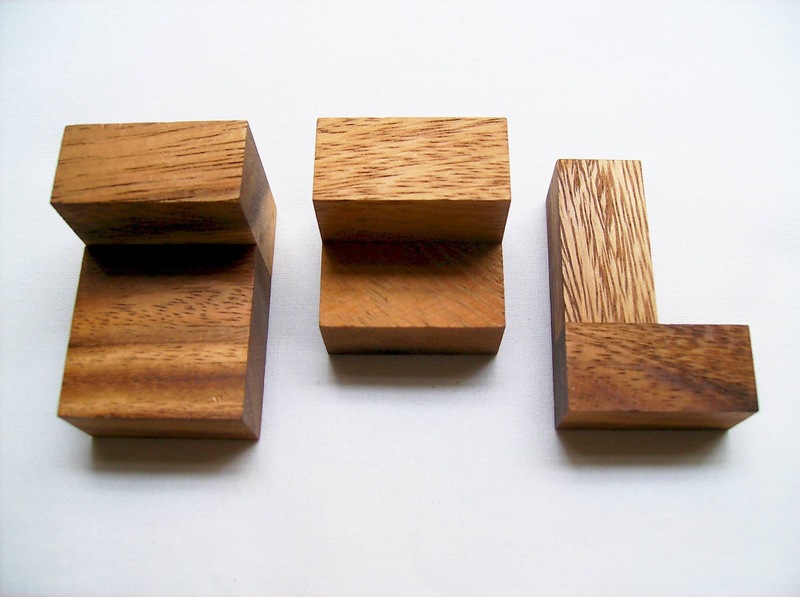 The Eni Puzzles come from South Korea and were invented by JongMan Kim, JeeSoo Kim and Tom Sebazco. They're 3D slide puzzles and you can find them in a variety of sizes and color schemes. 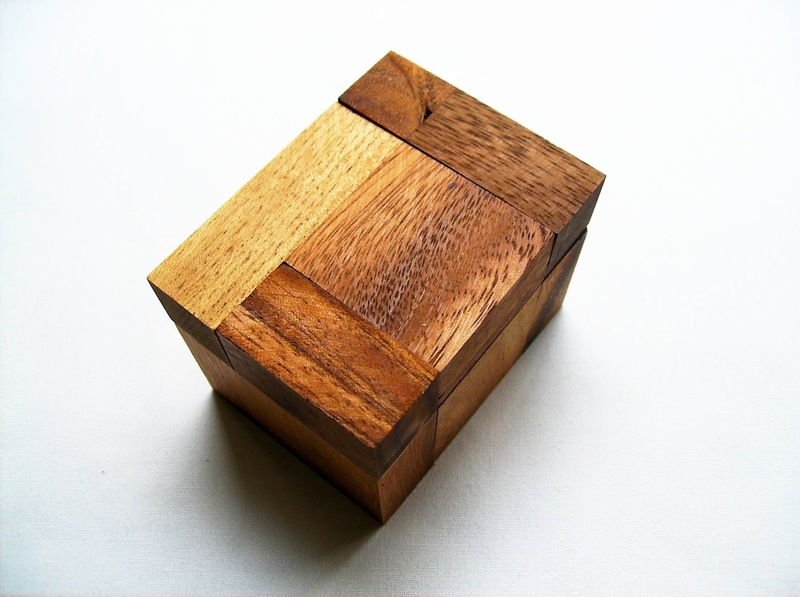 There's no specific goal for these puzzles. The challenge is to recreate any pattern that you can think of. 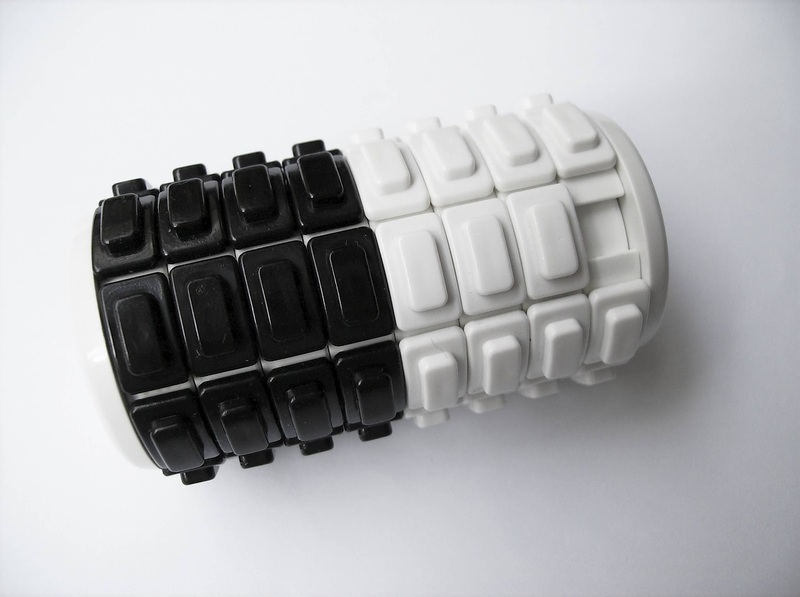 The Black & White Eni was developed by Tom Sebazco and comes in a unique size, same as the colored "mini", which is 6cm (2.4") in height and 3cm (1.2") in diameter. 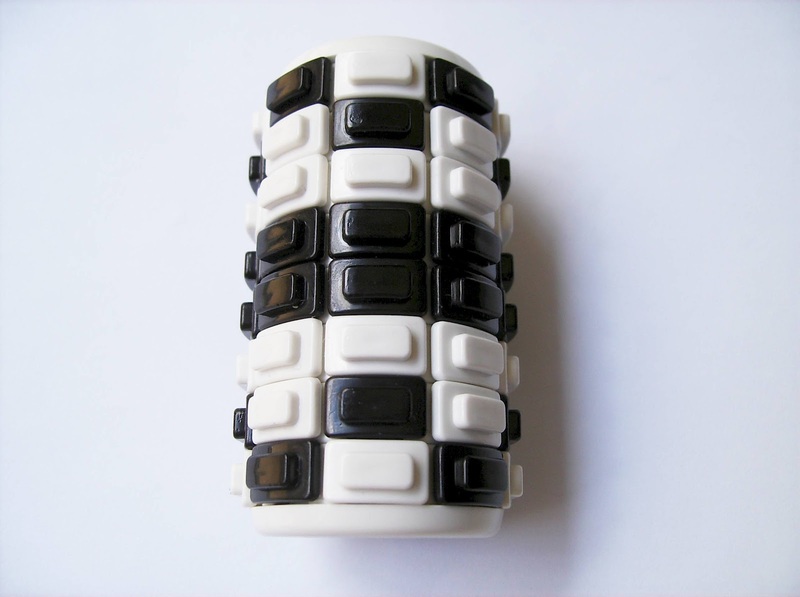 There are eight rotating discs, each with eight tiles except for one. The missing piece allows the tiles to slide up or down allowing them to move freely and this way, form all kinds of patterns. 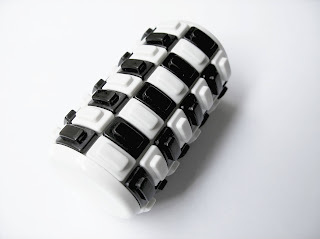 One of the puzzle's trademarks is the raised contours on the tiles, giving you a better grip to slide them. Because the puzzle is only in black and white, the patterns that you'll be able to build are much more varied and diverse, not in color obviously, but the contrasting colors will provide a wider range of recognizable designs. I also found it much easier and faster to solve than the color versions. With only two possible colors, it takes much less time to find and get the tiles where you want them, unlike the others where at times would feel a bit tedious to finalize any pattern, because there were eight different colors scattered around. Trying to come up with different patterns, I realized that it was quite difficult to solve them directly into the puzzle. I figured later that it was much simpler to first design the pattern on a sheet of paper and then, looking at the pattern, solve one disc at a time. This sounds trivial, and it is actually, but I just didn't think of it before. When you're designing a particular pattern to solve, there's one thing to always keep in mind: Be sure you have 32 black tiles and 31 white (the missing tile is supposed to be white). It actually happened to me a couple of times, when I was designing a pattern and realized that I had more black tiles than the ones available, so I ended up having to improvise. This only happens if the pattern you're trying to make is asymmetrical, though. For a list of available places to buy, check out this page. After trying both the color and Black & White Eni Puzzles, I must say that I very much prefer the latter. Making patterns is very easy and fun. The simplicity of the two contrasting colors is visually stunning and much more versatile, while solving-wise it's less time-consuming. If you're a creative type of person, then I recommend getting this version. Great to have around just to fiddle with. In the future, I would also love to see some other two-color variations - Blue/Orange, for example, which is my favorite color combination. Update: The company has plans to actually develop new two-color schemes and quite possibly have an assembly kit that'll allow puzzlers to choose their own color combinations. With this in mind, there's really a lot to look forward in the near future, so stay tuned. You won't need to do a whole-in-one in order to solve this puzzle. 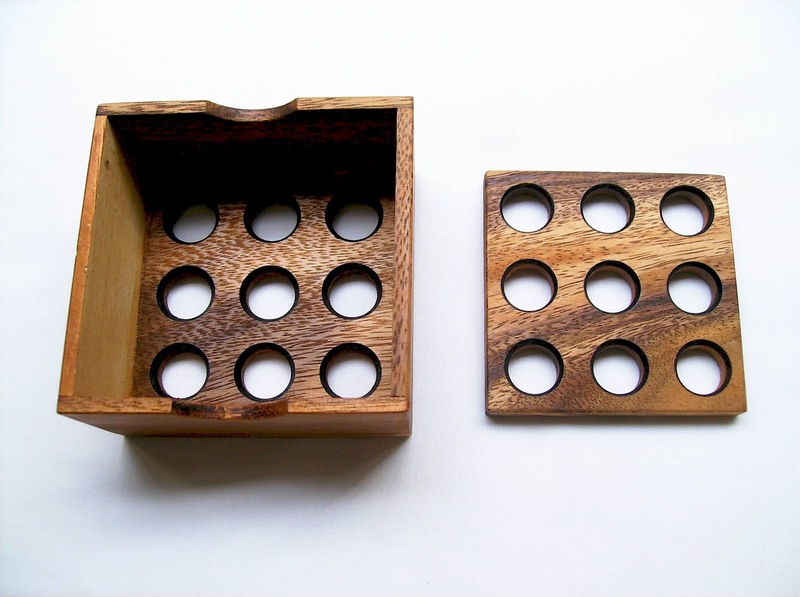 The Golf Puzzle is a very nice looking packing puzzle with holes and balls, and you have to lay them flat in the box, while being able to place the nine-hole lid without going over the edge. There are six different pieces, and each can have three different states in both sides, being a hole, a ball or just a flat space. 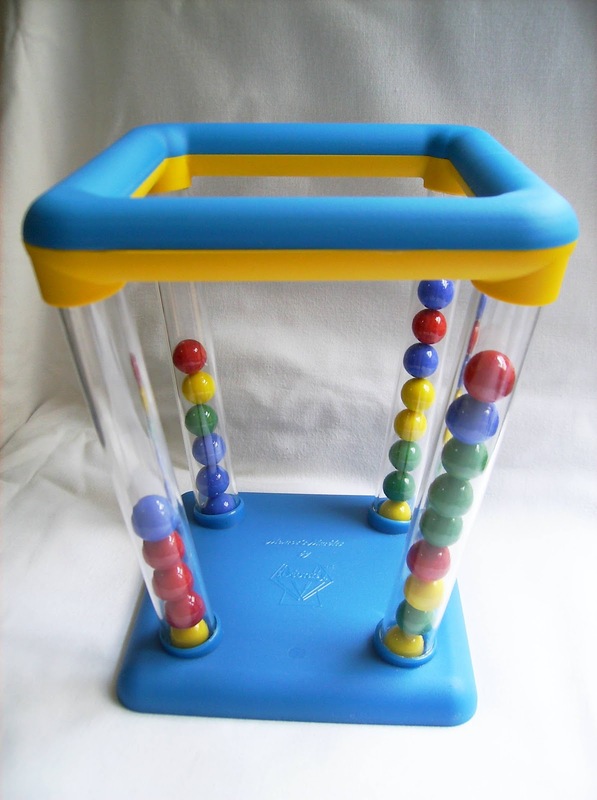 All but one piece have balls on both sides, making impossible to lay it flat on a surface, unless you place it over another hole. Planning ahead the strategy on how to place the pieces is crucial to solve the puzzle. The puzzle is called Golf, but I didn't know why until I've researched information for it. 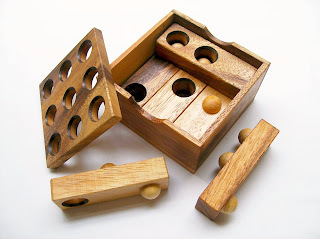 Apparently, this is a wooden version of a plastic puzzle that actually uses golf-like balls. They could have used grooves on the wooden balls as well, to stay true to the puzzle's name, but that would probably raise the overall cost. I have in my collection a puzzle with a similar concept, and I found it harder than the Golf Puzzle - Its pieces are less complex with just two spaces instead of three, but there are more pieces to complicate your task (12). 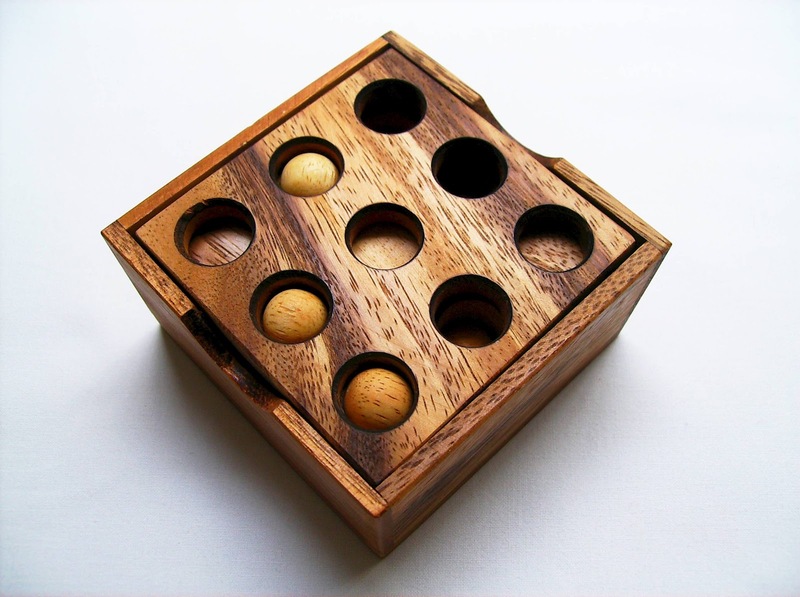 When solving the puzzle, there a few things to keep in mind: the two rows of pieces must be stacked perpendicular to each other, although I'm not entirely certain that there's a solution for the parallel configuration; not all holes need to be filled with a ball; as long as you're able to place the lid over the second row, the puzzle is considered solved. Brilliant Puzzles, the store where I got the Golf Puzzle, rates it as a 3/5 difficulty level, and I guess it's more than fair, because contrary to what it seems, it's actually a relatively easy puzzle solve. It took me no more than 5 minutes or so to find a solution, and judging from the provided solution sheet, which is different than mine, it has at least two possible solutions, but I reckon there must be more. It's actually a good exercise trying to find extra solutions. It gives a perfect excuse to keep playing with the puzzle. While the concept of the Golf Puzzle is not new to me, I really enjoyed playing with it. 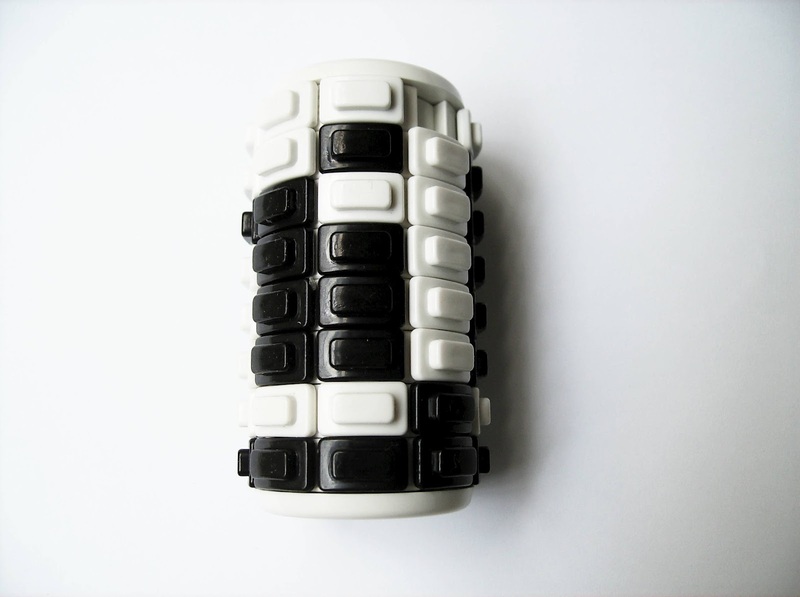 The complexity may not be the most challenging you will find, and by that, the solving time will be quite short, but you can always keep playing and try to find other possible solutions. Wouldn't mind seeing a version with nine pieces and three rows, though, which would most certainly increase its difficulty level. Availability: The Golf Puzzle is available at Brilliant Puzzles in two sizes: I have the large one, measuring 10 x 10 x 5'5cm (4" x 4" x 2.2"), but there's also a medium size measuring about 9 x 9 x 4cm (3.5" x 3.5" x 1.5"). If you like golf themed puzzles, search their page for "golf" and you'll find several other designs. 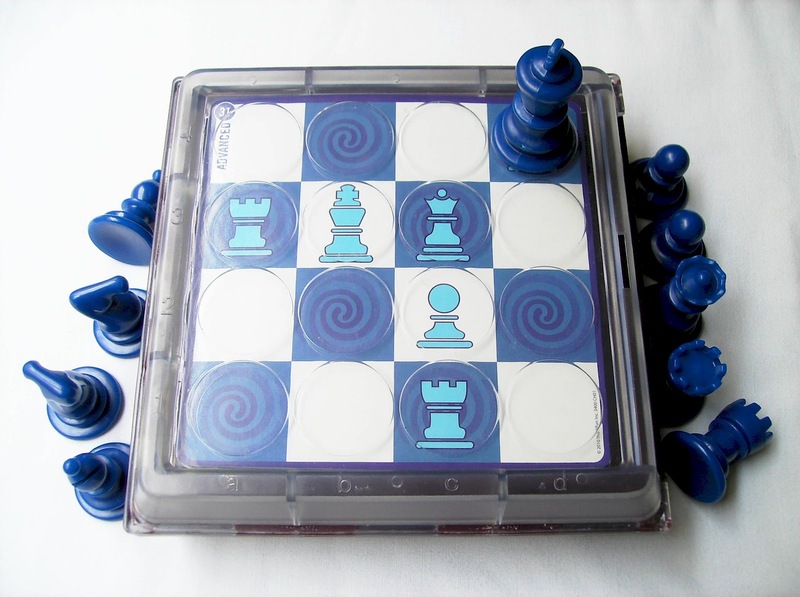 Solitaire Chess is a logic puzzle/game invented by the Finnish Vesa Timonen and produced by Thinkfun since 2010. 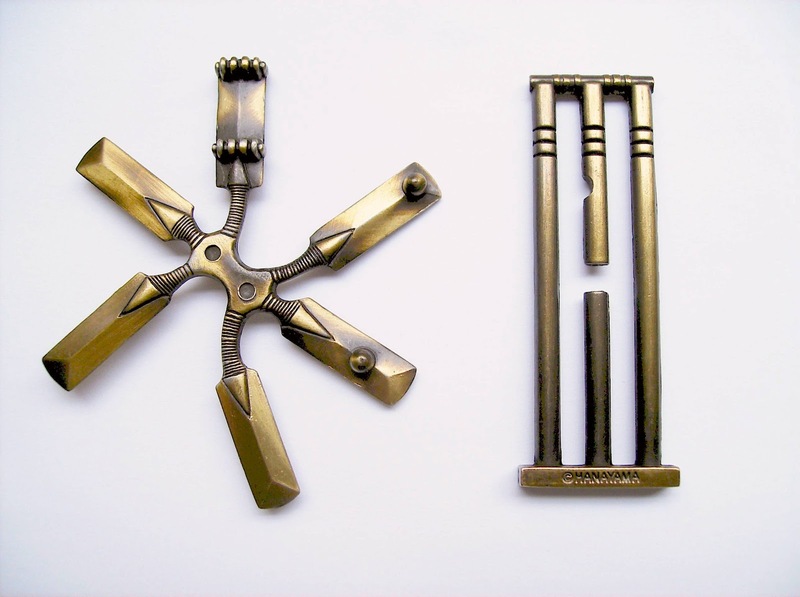 Vesa has also contributed with some of his designs for the Hanayama Cast Series, like the Cast Square or the Cast Loop, among others. 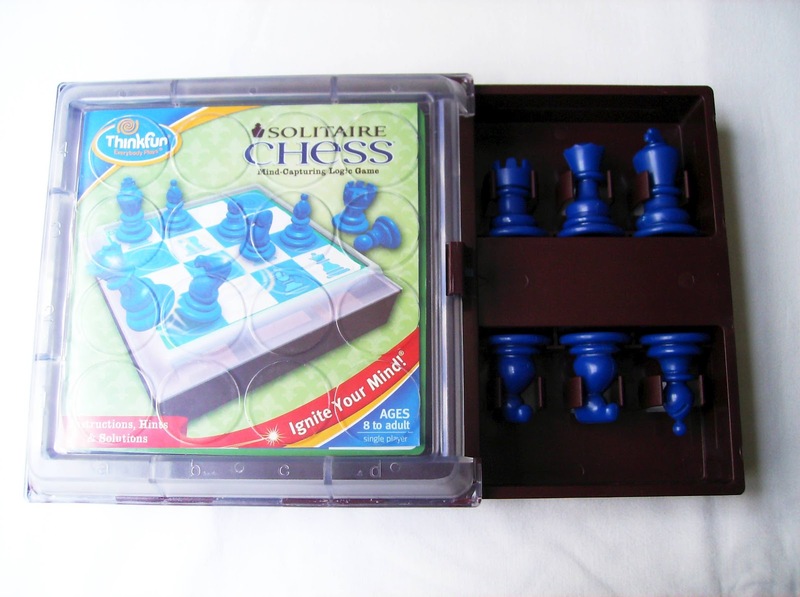 - The Solitaire Chess is a simplified version with a quarter of the size of a normal chess board. - Since the game is for one player only, all the pieces are the same color. - Every time you perform a move, you must capture a piece. - Pawns are not promoted when they reach the top row. - The "check" rule is not applied for the King. - Every challenge that includes the King will result in it being the last piece on the board (The King is never captured). 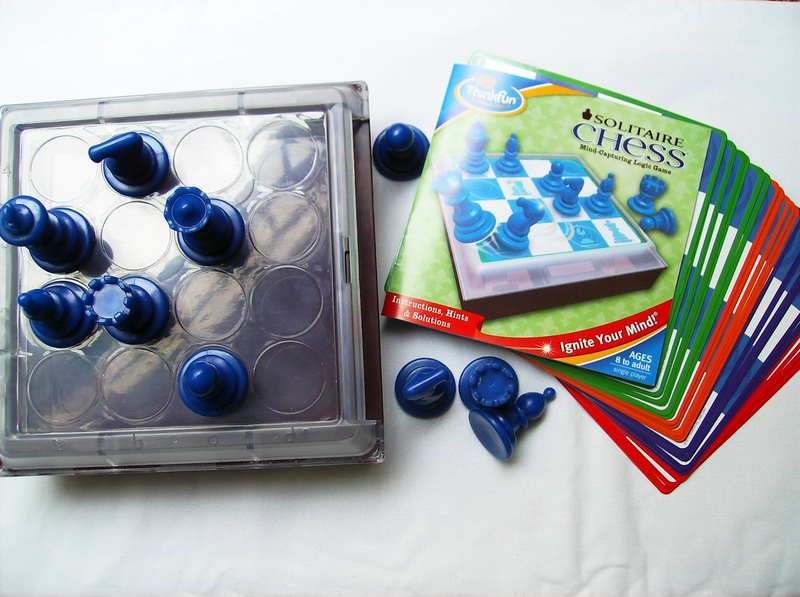 With these differences in mind, getting started with Solitaire Chess won't be a problem. 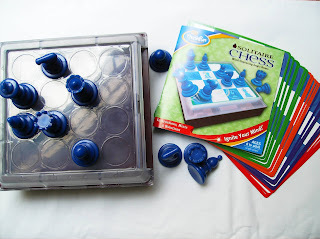 Included with the game are 30 double-sided challenge cards (60 challenges in total) divided in four levels of difficulty, ten chess pieces (1 King, 1 Queen, 2 Rooks, 2 Knights, 2 Bishops, 2 Pawns), a chess board with a storage drawer and an instruction booklet with hints and step-by-step solutions. 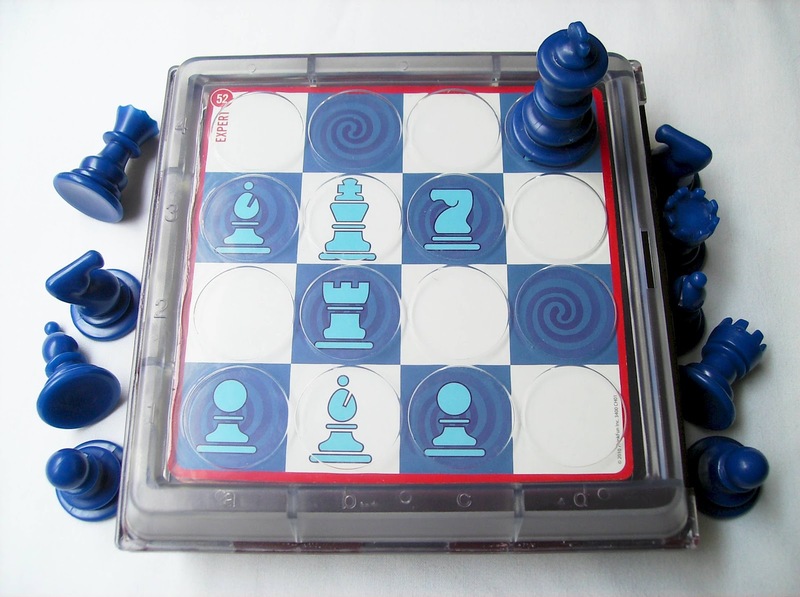 To set up a game, start by choosing one card with the desired level of difficulty and place the corresponding pieces on the board. You know you've solved the challenge when you have only one piece left. If you are left with more than one piece and there's no more possible moves, you need to reset the challenge and try again. For someone like me that knows how to play chess, the Solitaire Chess is a surprisingly addictive game. 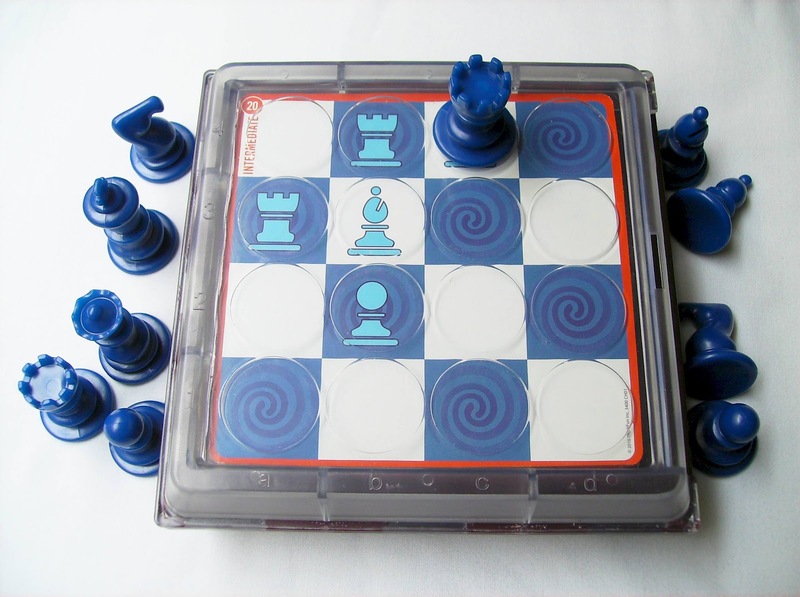 If you're an experienced chess player and think that this game is not worth your time, you couldn't be more wrong. My only advice is to start from the harder challenges and you'll see that there will be times when you have to think very hard in order to know how to solve them. 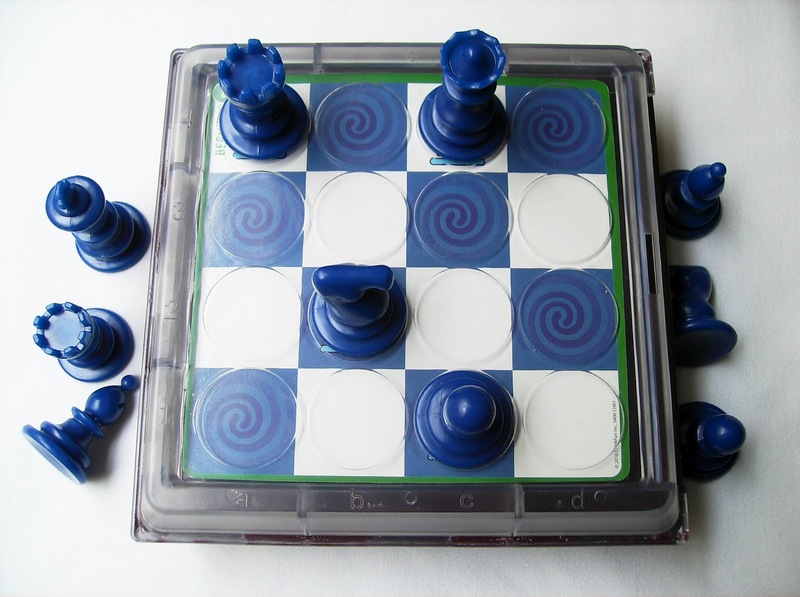 The strategy behind the Solitaire Chess is somewhat similar to the traditional chess in that you have to think many steps ahead. I haven't played chess for a while now, maybe since I've started collecting puzzles back in 2008, but after playing a few challenges on the Solitaire Chess, I find myself totally immersed in it. The beginner and intermediate challenges are great to get the hang of it, but the serious ones start when you reach the advanced level and of course, the ultimate level, the expert. I can manage to solve the advance levels within 5 or 10 minutes, but the expert ones, can take up to 20 minutes, although I've solved a few within 10 minutes. This goes to show you that every type of player will have challenges that will certainly meet his skills, from novice to pro. 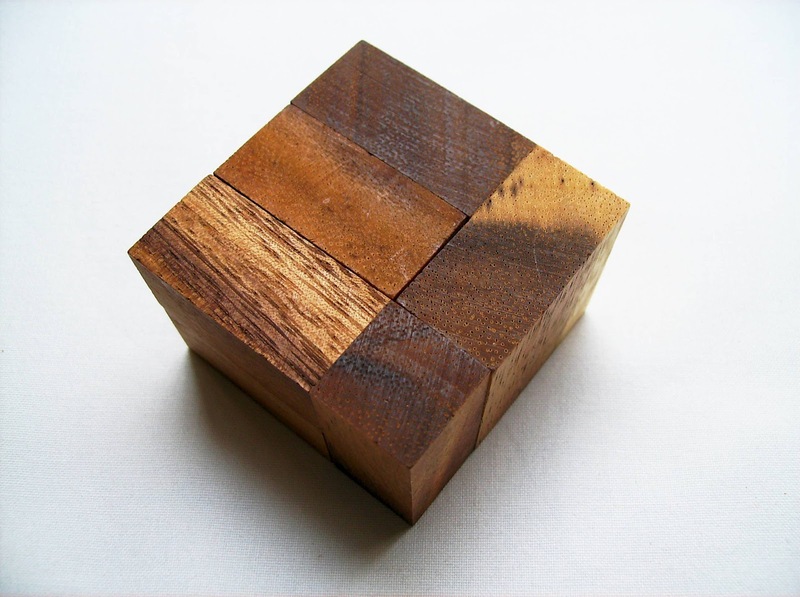 After you've solved all challenges, you can try them all again after a while and see what you still remember. Great replay value. 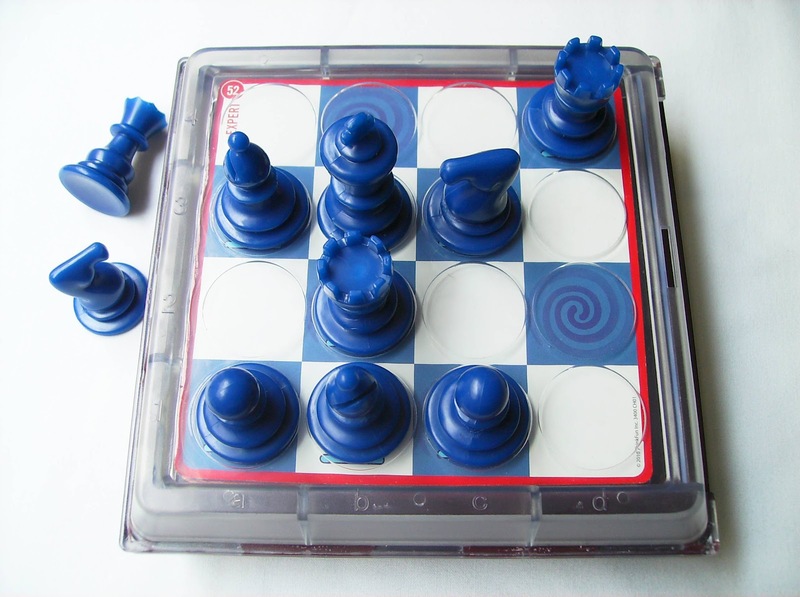 The Solitaire Chess is available at Sloyd.fi for €24. 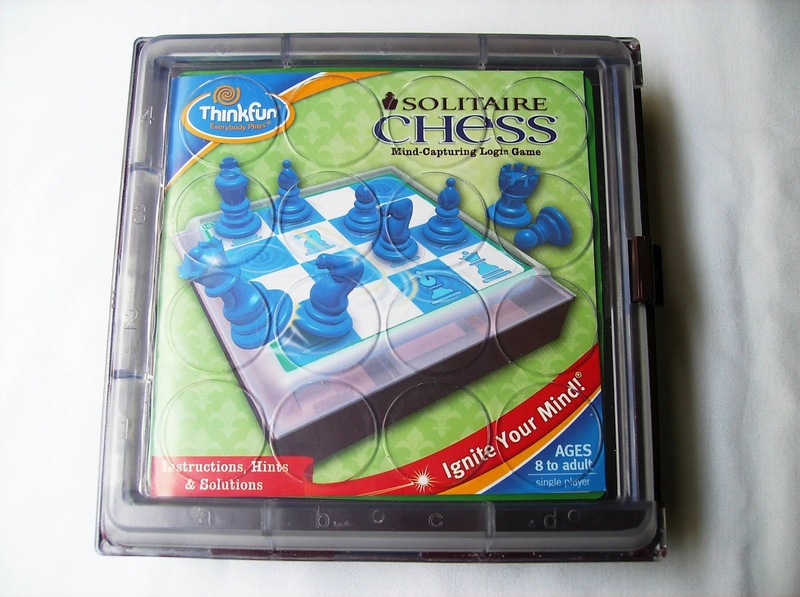 Video: Check out Thinkfun's presentation video for the Solitaire Chess. 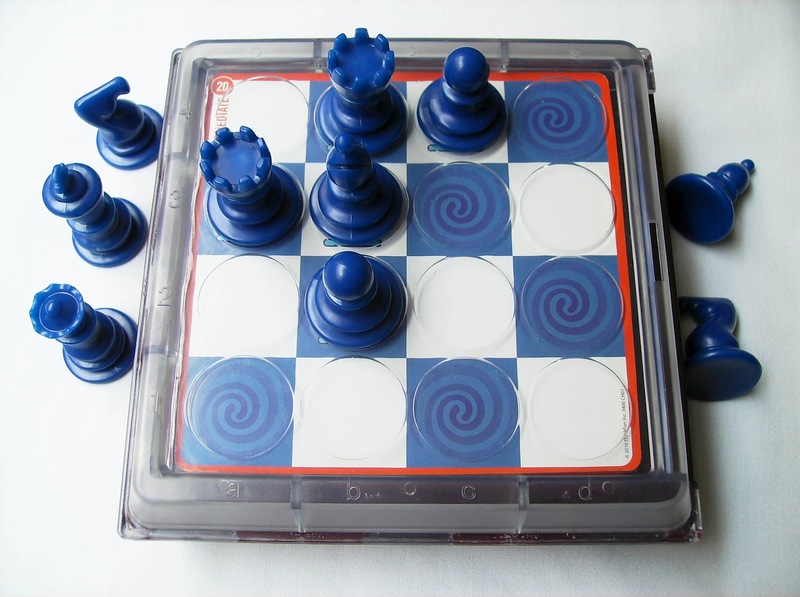 The Solitaire Chess is a brilliant concept and adaptation of traditional chess. 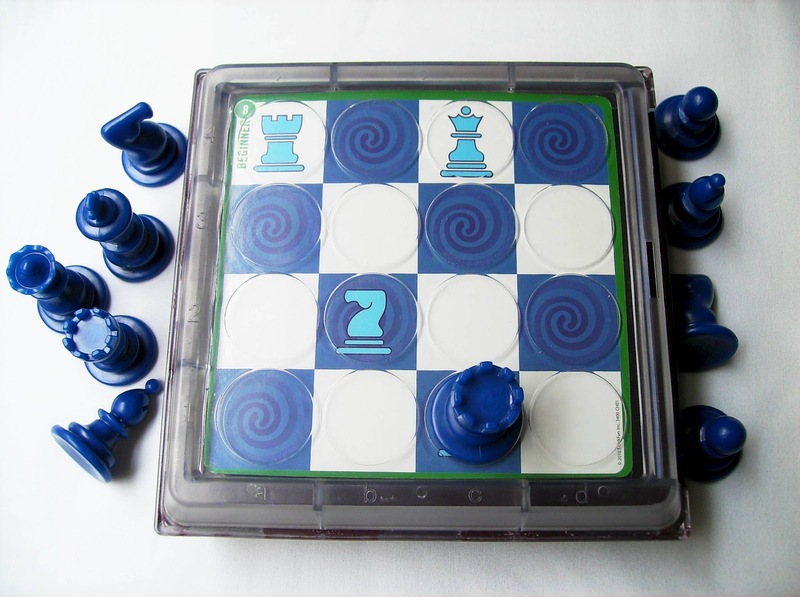 It borrows the essence of chess and turns it into a fantastic and addictive puzzle/game that will be hard to put down until all challenges are solved. This is by far, in my opinion, one of the best puzzle/games from Thinkfun and also from the genre. I recommend it to anyone that is remotely interested in puzzles. 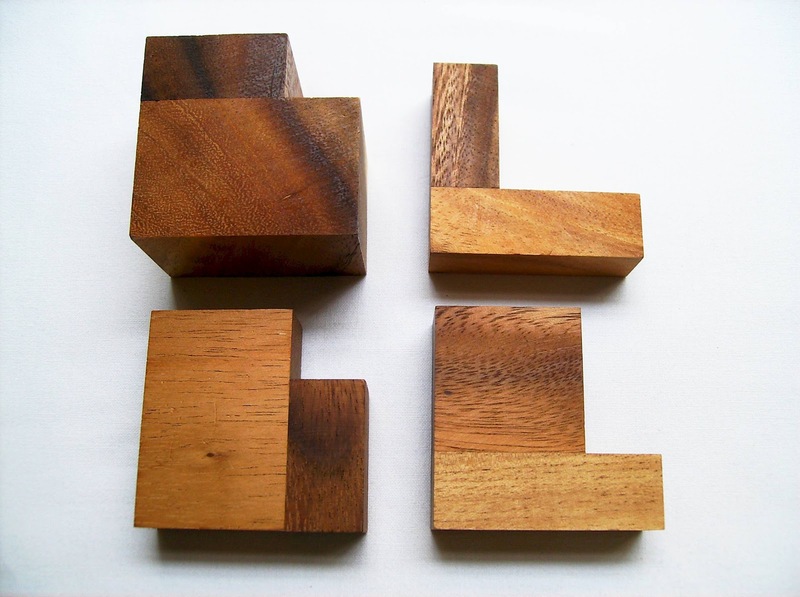 The 8 L-ements is a very interesting Assembly/Packing wooden puzzle invented by Prof. Rick Eason and manufactured exclusively at Puzzle Crafthouse (a.k.a Creative Crafthouse). It's dimensions are 9x9x9cm (about 3.5"). 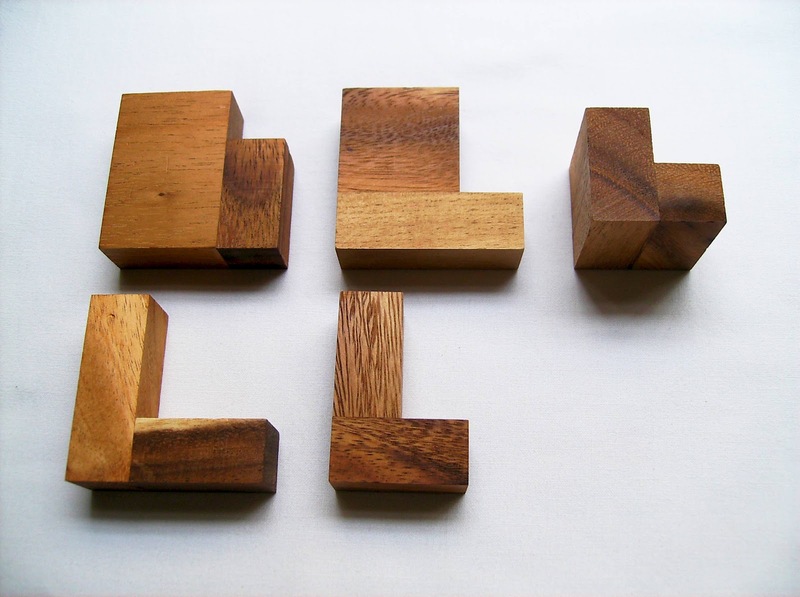 The inventor also has two other related puzzles, the Nine L-ements and the Seven L-ements. 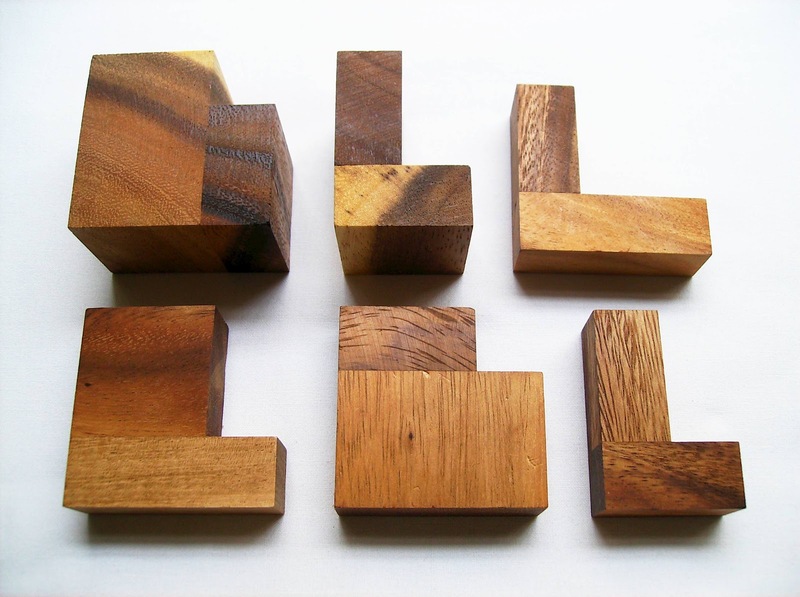 As the name suggests, there are eight L-shaped pieces, all dissimilar and with different widths. Saying that all pieces resemble the letter L is a bit of a stretch, though, but you get the idea, as they all make a right angle like an L. The puzzle also reminds me of George Bell's Nine Bed Nightmare, because of the same type of L-shaped pieces. The pieces can be divided into two main groups. One group has four one-unit thick pieces that can range between four and eight units in area. The other group has four two-unit thick pieces, and these can be between six and sixteen units in area. The main goal of the 8 L-ements puzzle is to assemble a 4x4x4 cube. There's only one solution to accomplish this, excluding rotations. 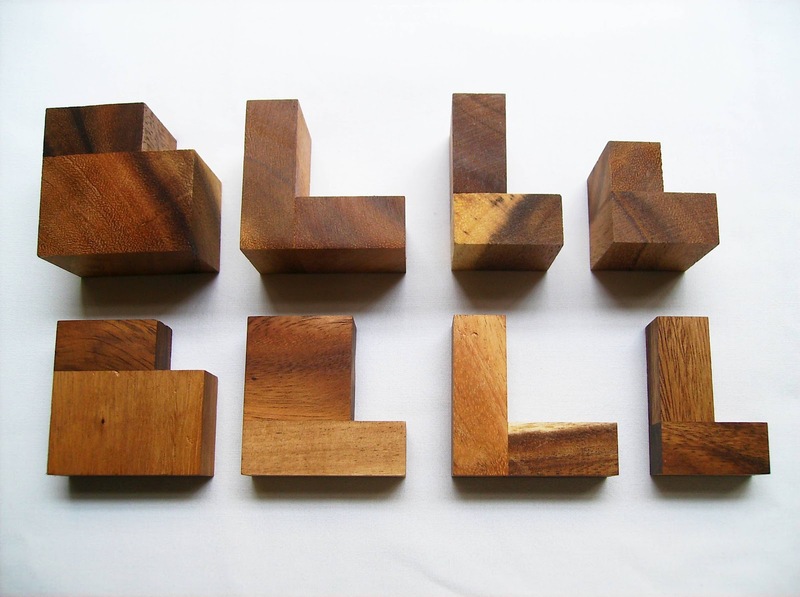 In order to practice, you can also build many other rectangular shapes from three to seven pieces. Including with the puzzle is an instruction sheet with 40 challenges and their respective number of available solutions. I have solved several of the secondary challenges and they're all relatively easy to solve, and most of them have multiple solutions. You can also see in my photos, at the end of the post, one challenge example per number of pieces: 3, 4, 5, 6 and 7. 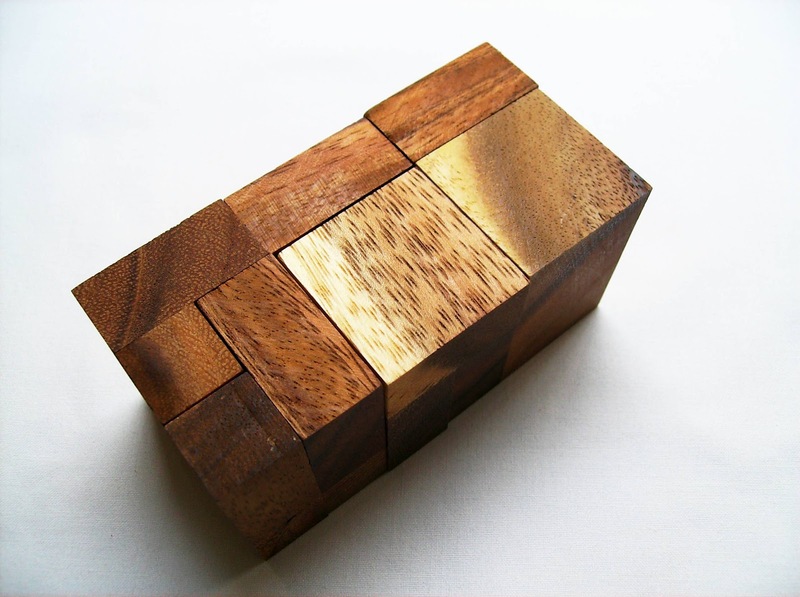 The alternative challenges are a great way to practice how the pieces interact with each other, but at the same time gives you many more reasons to keep puzzling. 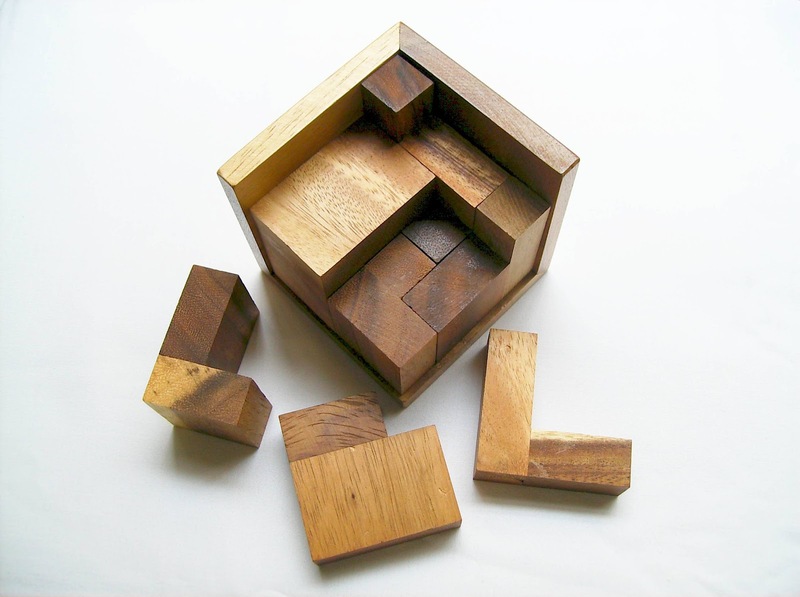 Update: I've been informed that the 8 L-ements puzzle is in fact a level 4 puzzle and not a 3 like it was described in Puzzle Crafthouse's website. This has now been corrected. 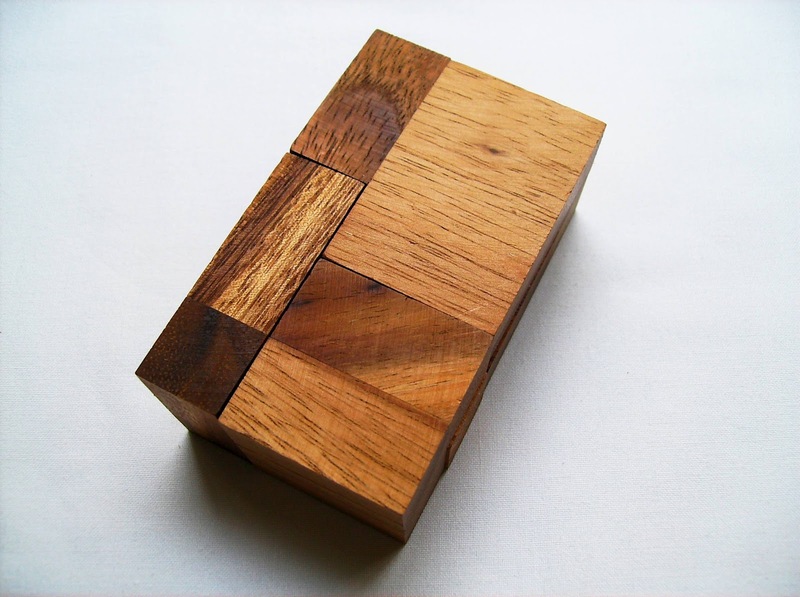 The 8 L-ements puzzle is available at Puzzle Crafthouse for an affordable $20 USD. I enjoyed playing with the 8 L-ements very much. It did take a little more time to solve than I would've liked, but I din't mind, because I could solve its many other challenges in between sessions. Despite being easier than the main task, the secondary challenges are a very welcome addition to the puzzle, expanding its lasting appeal. Given the fact that many of these challenges have dozens and even hundreds of possible solutions, there's plenty to keep you entertained for weeks to come. Great to keep around in a desk for when you're bored. 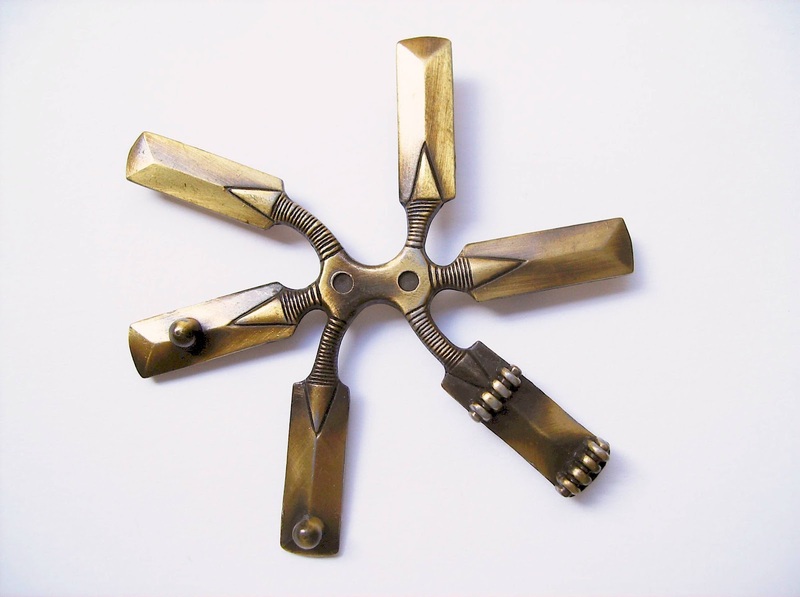 The Cast Cricket is Hanayama's own version of a puzzle, which first appeared back in 1898. This new version released ten years ago, in April 2002, by the hand of puzzle collector James Dalgety, hopefully stays true to its origins. 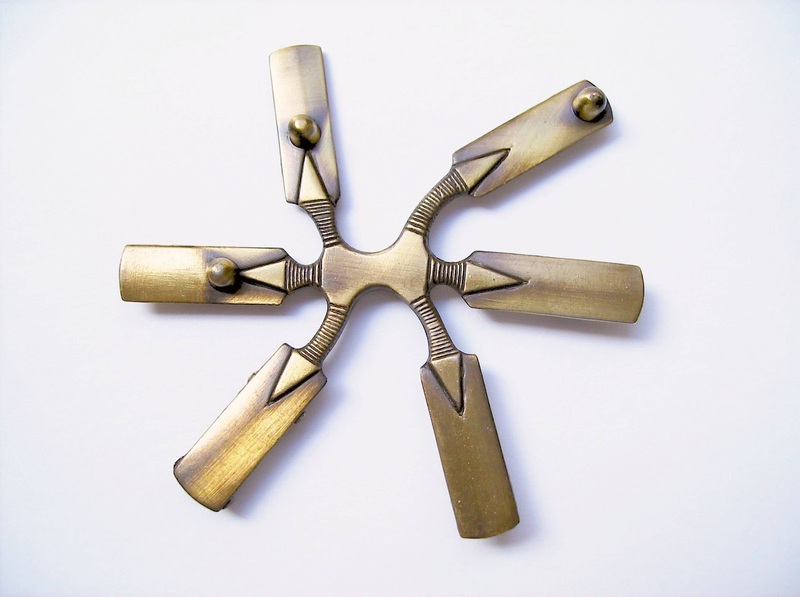 James also designed another puzzle for Hanayama, the Cast Medal. The puzzle is an homage to the game of the same name, played since the 16th century. It depicts two of most known elements in the game, the bat and the wicket, which are entangled. Your task is to separate them and then, put them back to their original state. As always, the design of any Hanayama puzzle is aesthetically very pleasing. 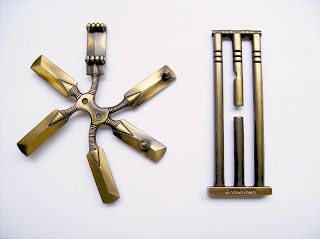 Both parts are made in brass and well polished, giving a nice clean look. The main part of the puzzle representing the bat has sort of a propeller-like appearance to it, comprised by six bats. You can see in the photos below that the configuration of the bats is different in both sides. Looking closely at the puzzle and its features, you can see that the bats all have a single pin at different positions, except for one. 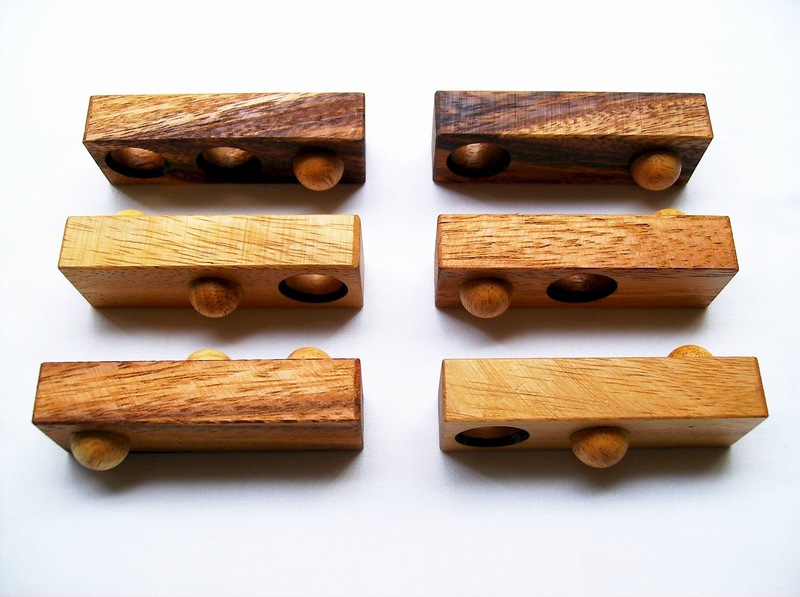 The odd one out with two pegs is the key to solve the puzzle. All the other bats with pins can pass through the middle gap in the wicket, but not the one with pegs, and that's when the groove in the middle top comes in handy. After you work out how to get the bat with two pegs to pass through the two openings, the puzzle is solved. You'll have to twist and turn the bats a few times to get there, though. For a complete solution, click here. A perfect gift for any fan of the sport, the Hanayama Cast Cricket was a joy to play with. Not at all complex, but still quite fun to solve, it can prove to be a pleasant surprise for the more experienced player. Availability: My Cast Cricket came from PuzzleMaster and is available for about $13 CAD. You can also find many others in the Hanayama Cast series here. 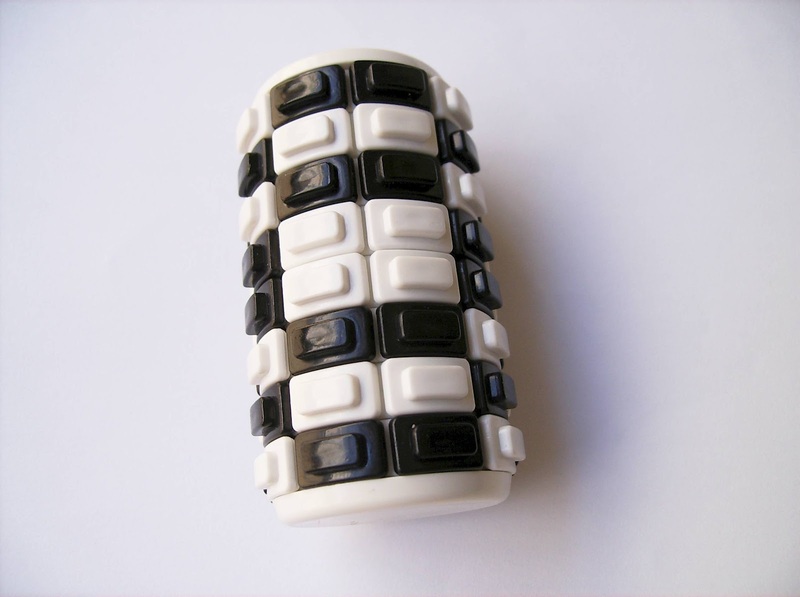 This unusually shaped, and yet fascinating puzzle is called Monroe's Marbles, invented by Donald Monroe Jr. in 2004 and manufactured by Dionny Inc.
Monroe's Marbles has twenty-eight marbles in four colors and four acrylic tubes. 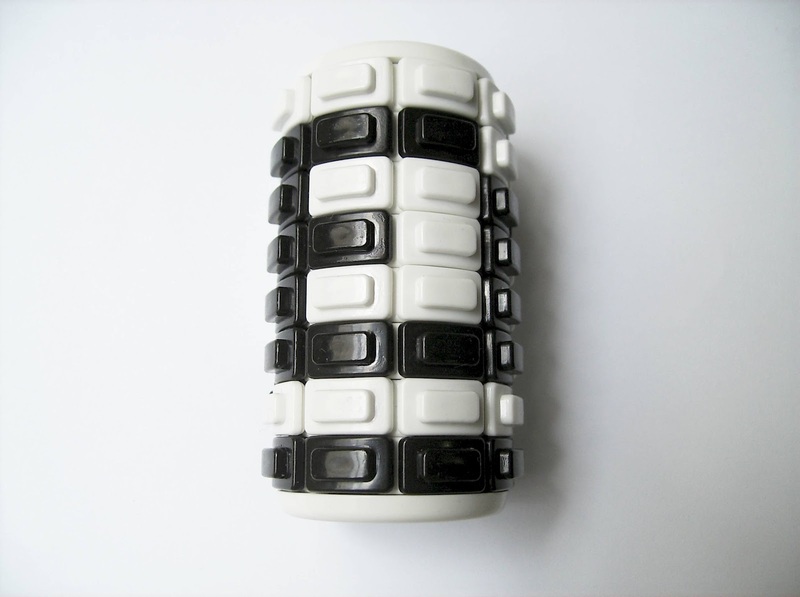 An opaque square tube connects the vertical tubes allowing the marbles to be transferred from one tube to another. If you look closely, you'll see that the acrylic tubes aren't exactly vertical, but more like with a subtle inclination angle, which makes it easier to get the marbles out of them. 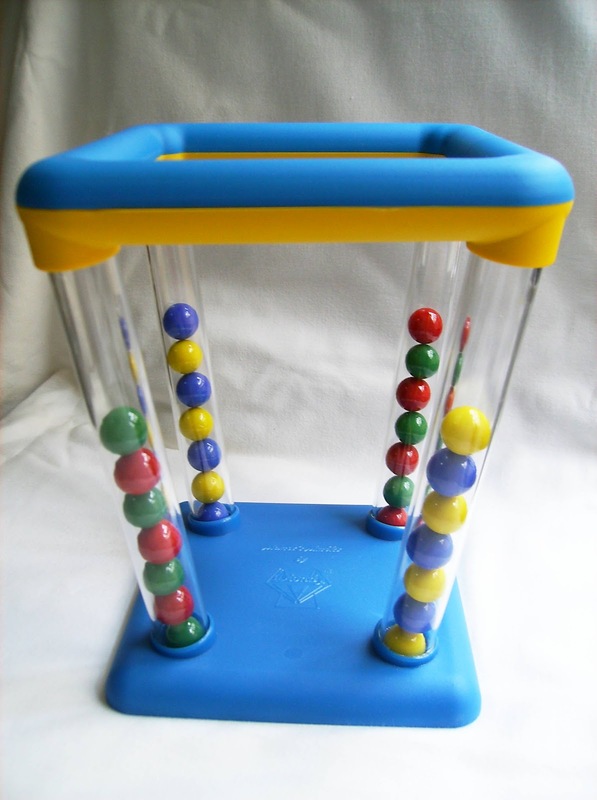 The goal is to get seven marbles in each of the four tubes so that they show a specific pattern, e.g., same color marbles for each tube. At first sight, the puzzle looks like just a child's toy, but there's much more to it than it shows. 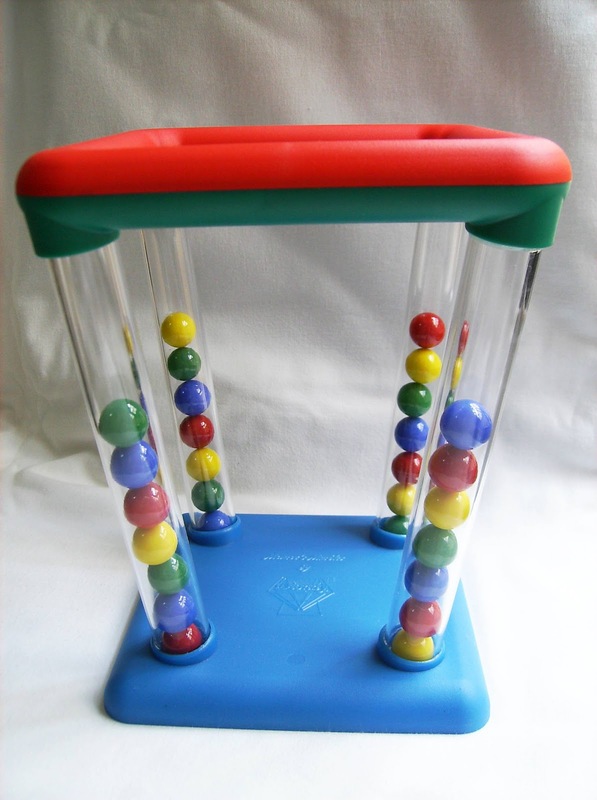 As the name suggests, the balls are actually colored marbles, not plastic balls, and this is noticeable by the sound of them colliding with each other. 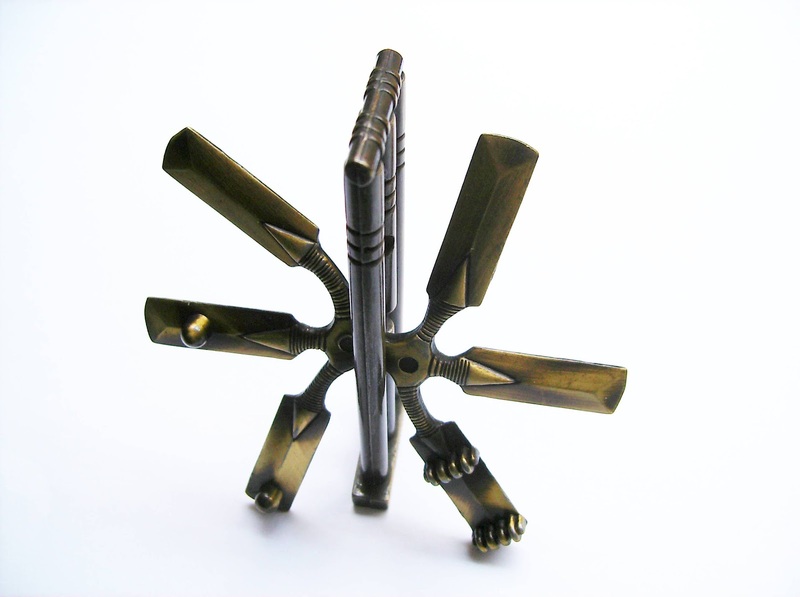 It's also quite a big puzzle, measuring about 17.5cm in height and 14.5cm in length (top) (about 7" x 5.7"). 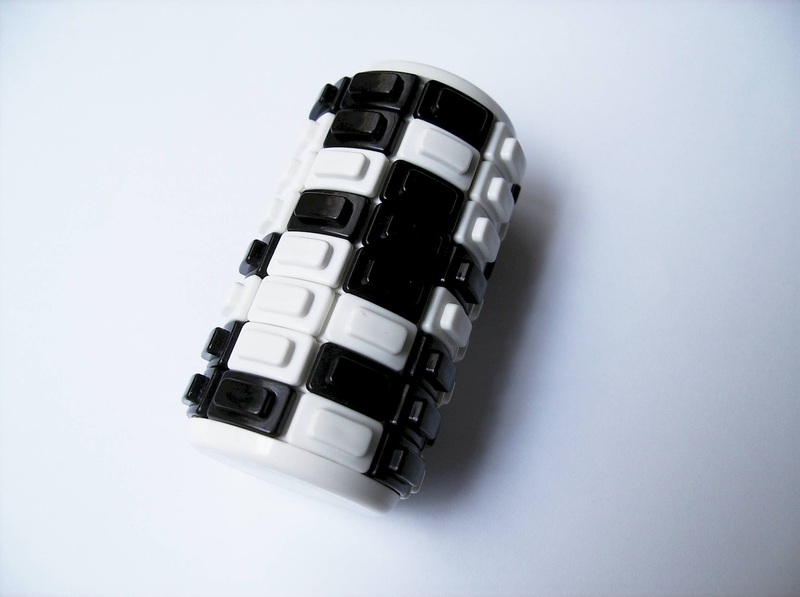 A great thing when ordering the puzzle is that you can choose the color combination you want for the opaque tube and base. There are four colors to choose from: blue, red, yellow and green (same colors as the marbles). 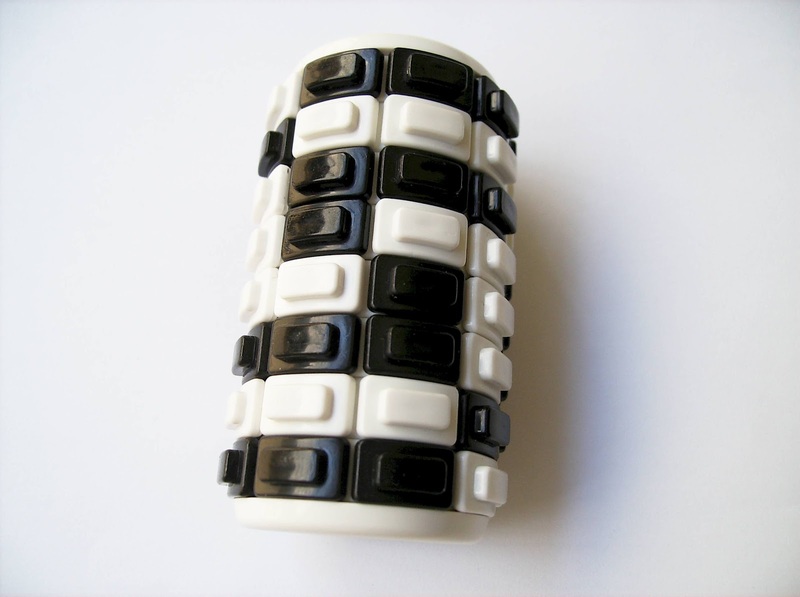 The opaque tube can have one or two colors, giving the entire puzzle a combo of two or three different colors. 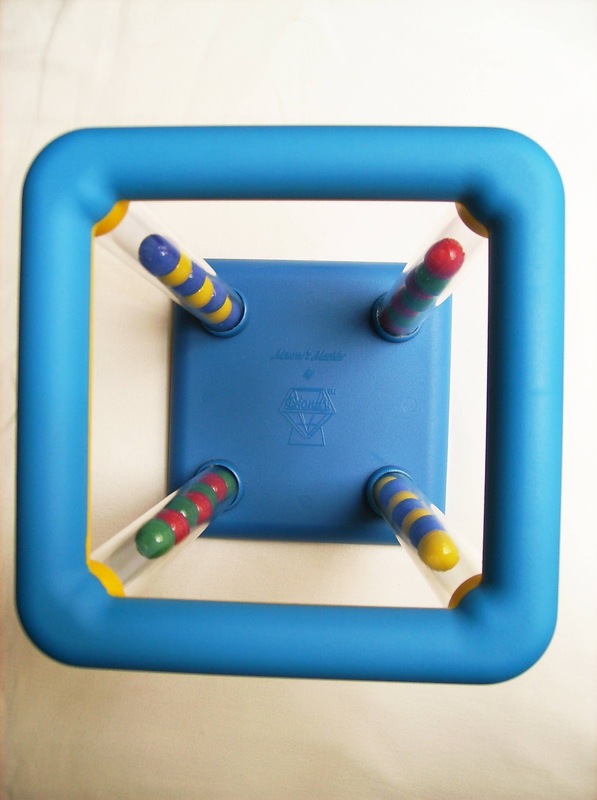 For me, I chose two combinations for two puzzles: blue-yellow tube and blue base; red-green tube and blue base. Solving the Monroe's Marbles looks harder than it actually is. Getting any of the desired color patterns takes no more than 10 minutes or so. It is a sequential movement puzzle, so it only requires a bit of concentration. 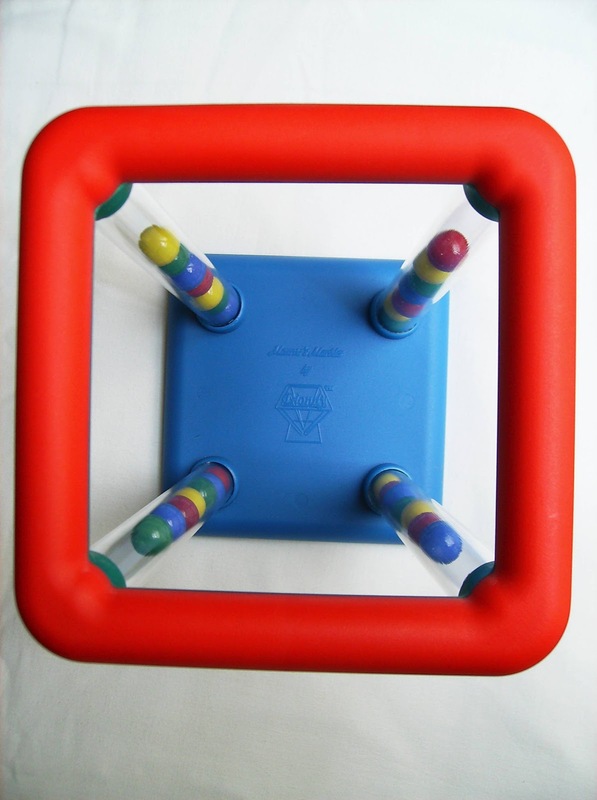 The puzzle comes with instructions and a scoring table: One Tube -> Beginner; Two/Three Tubes -> Intermediate; Four Tubes -> Expert; Four Tubes w/ Color Pattern -> Genius. I reckon that if you solve one tube, you won't have problems with the others, as they're not that much harder. Just take a little more time, because you have to move one marble at a time. 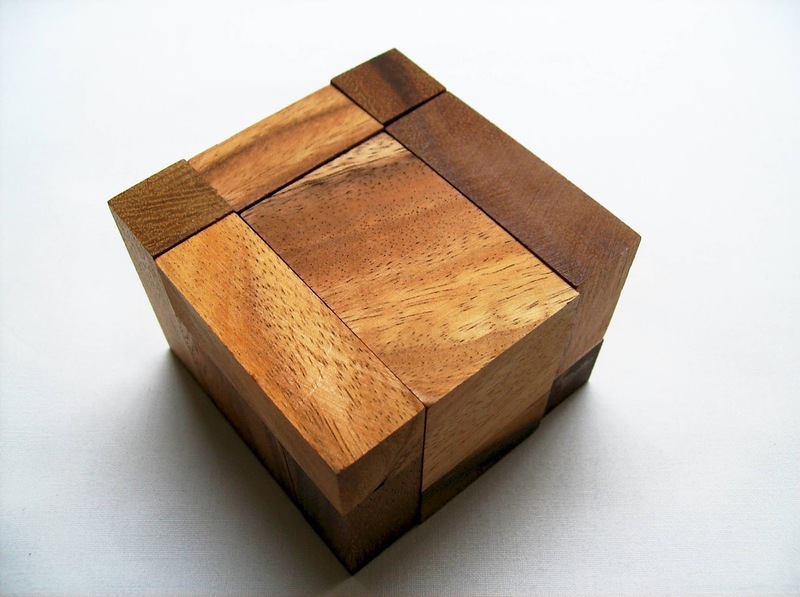 To get the puzzle scrambled, all you need to do is hold it upside down while holding the base. Then, shake it until all marbles disappear into the opaque tube and turn it over again. After having the puzzle well scrambled, choose a color pattern and solve it. 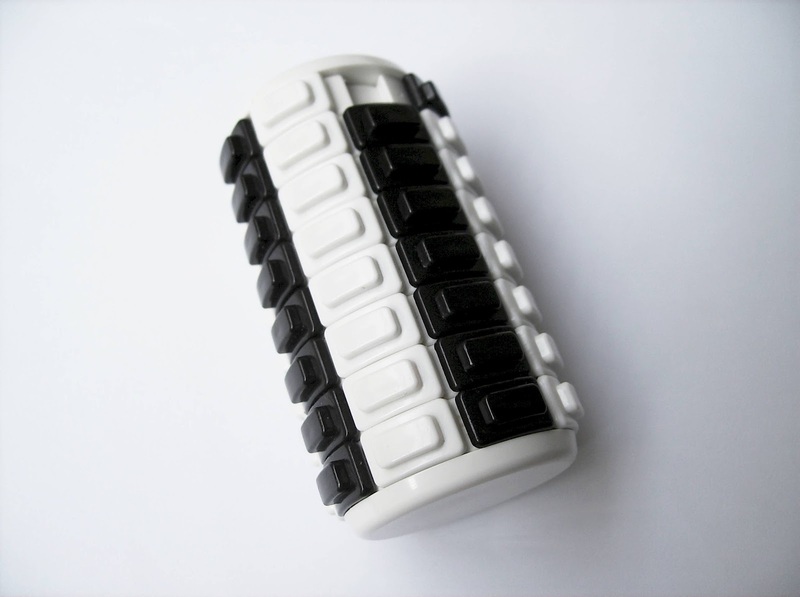 You'll notice that the acrylic tubes are longer than the seven marble length, so take advantage of this. Each tube can hold up to eleven marbles, although if you fill it entirely, there's not enough space to let another marble pass through that tube. The ideal number is ten marbles per tube. Getting a desired marble from one tube to another may be a little frustrating at first, but there's a simple trick to do that. 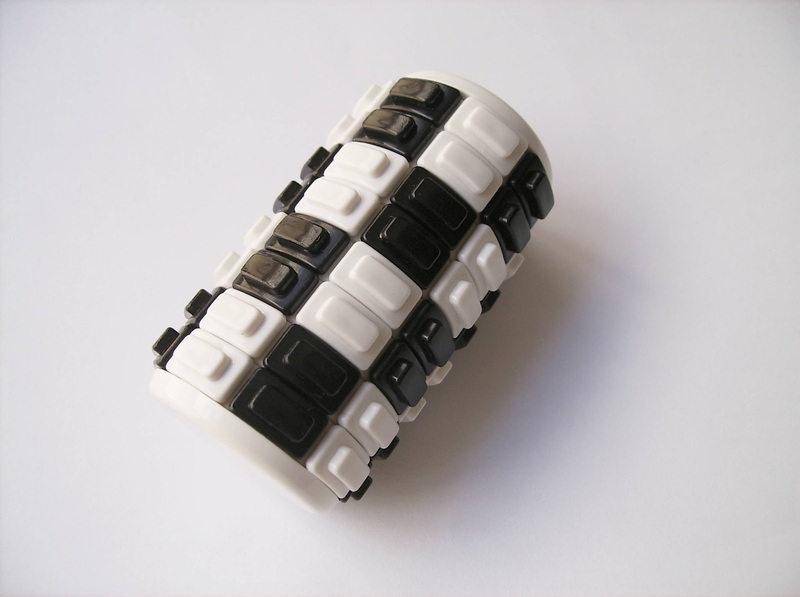 Just hold the puzzle at an angle with the tube that holds the marble you want to move, facing the floor. With a gentle move, the marble will roll down the acrylic tube into the opaque one and then, just tilt the puzzle until it reaches the tube you want to place it. Repeat until solved. Solving the Monroe's Marbles is quite fun, although it's far from challenging and it can be a little repetitive if you attempt to solve multiple challenges one after another, but ultimately, that's what sequential movement puzzles feel like. You just have to be patient with them. 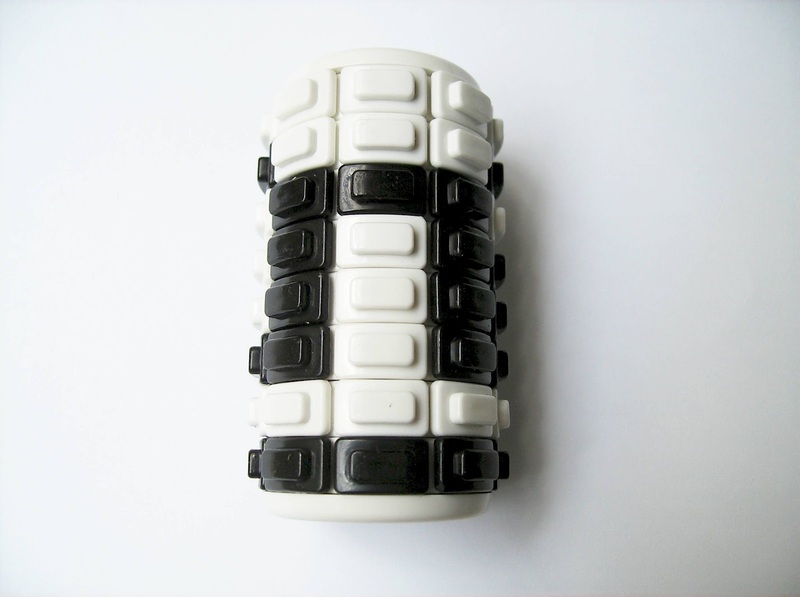 Be thankful it doesn't require 1000+ movements like some of the more complex in this category. Availability: The Monroe's Marbles are available directly from the official website at $12 USD per puzzle. Multiple purchases have discount. Also, feel free to choose your own color combo, as you won't be charged for that. Beehive is yet another great design made by Jean Claude Constantin, an assembly pyramid puzzle comprised by 11 hexagon-shaped pieces. One of the great things about Constantin's puzzles is that most of them are quite affordable and widely available. The elegant design made with a stylish wooden stand and a wire rim complements beautifully the shape of the finished puzzle. The pieces are made in two types of wood, darker in the tips and in the middle section, and lighter in the outer edges, which makes the pyramid shape stand out even more. While it's a Constantin's design, I'm sure it wasn't built by him, because as you can see, the pieces don't line up perfectly with the stand. Just a bit of improvement cutting the pieces with more accurate tolerances and the appearance would've been perfect. 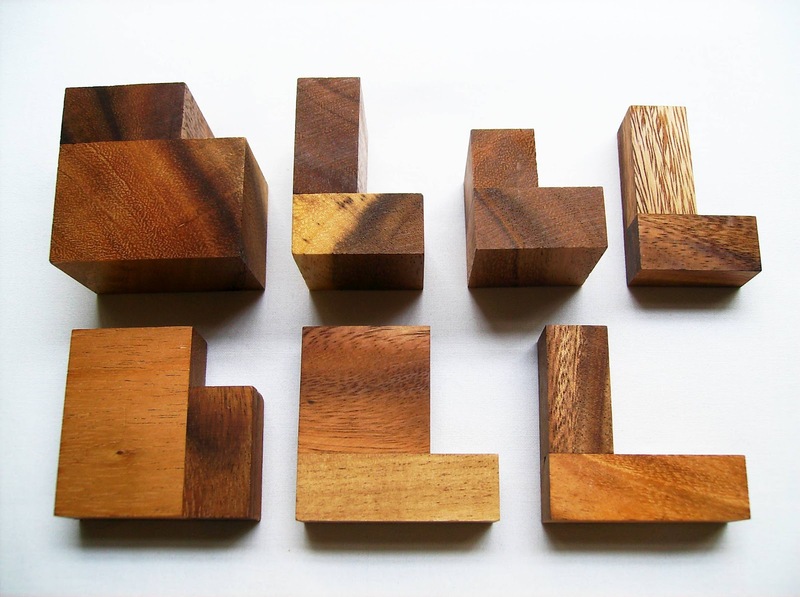 Because the pieces are all different in shape and color, this is a highly difficult puzzle to solve. The pyramid has a length of 5 by 3 unit hexagons, which in total is 45 units. Given the fact that the darker hexagon shapes are six, and knowing that the pyramid looks the same seen from either side, you would expect to have 18 dark unit hexagons... In fact, there are only 17, and that's quite unusual, to say the least. When I first started to solve the puzzle, I was unaware that the darker hexagons were one less than expected. And no, there isn't any empty space in the middle, as the total of hexagons totals 45, so the real answer is that one of the middle hexagons has to be light, instead of dark. It took me quite a while before I noticed this. I honestly don't know if this particular characteristic was done with an intent to mislead us or it's just a factory defect, but either way, I didn't like it. If it's supposed to be that way, I don't see the point, because the darker tone units are supposed to be there as a guide towards finding the solution, otherwise might as well have the whole puzzle with one color. Moving on... Solving the puzzle with dark and light pieces, but keeping in mind the light hexagon in the middle, the puzzle is still very hard to solve. It took me about two days of constant puzzling to finally solve this. 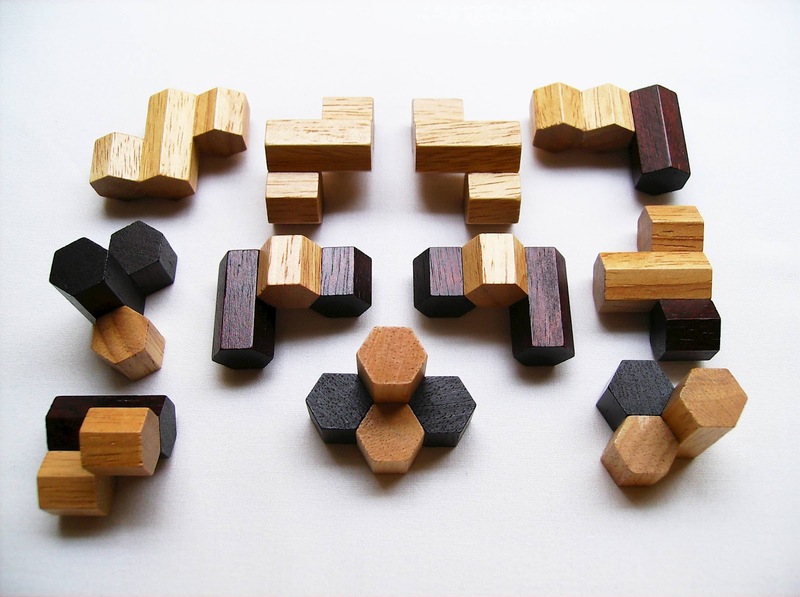 I guess the nature of the pieces is what makes it more difficult, because we're used to the pentomino pieces and it's harder to visualize the hexagon shapes in a 3D puzzle. Another difficult part of the puzzle is solving it in the stand. My advice is to solve it in a flat horizontal surface instead of the vertical, like the wooden stand. It's easier to visualize what you're doing and the pieces are more stable that way. 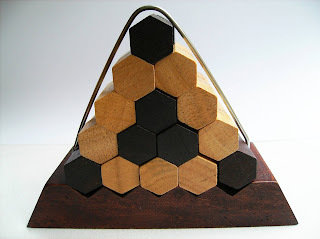 The Beehive pyramid puzzle is available at Brilliant Puzzles for about $13 USD. Still not convinced that the light hexagon in the middle is supposed to be there, I liked the design and concept of the puzzle very much. 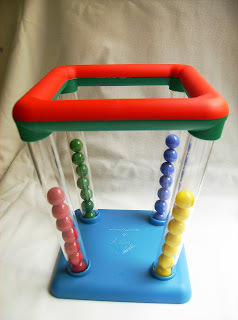 Looks great on a shelf or a desk and it's a very tough challenge to solve. Ultimately, it's a Constantin's design and a collectible, so you can't go wrong with that.